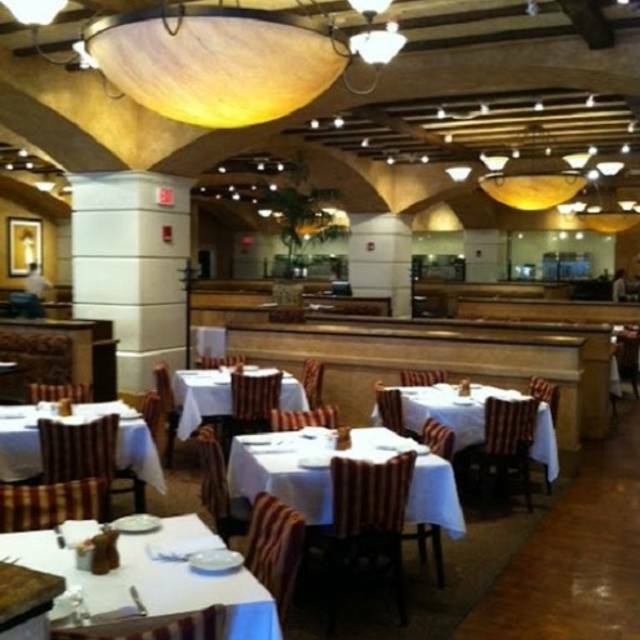 You must make reservations at least 5 minutes in advance of the time at BRIO Tuscan Grille - Kansas City - Country Club Plaza. Bring your Brio favorites to your next event. Our catering menu offers large pans that you can bring to any occasion. 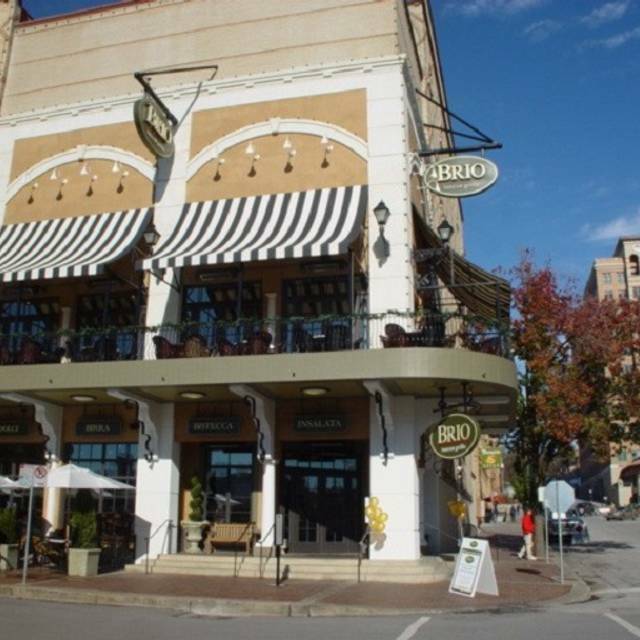 We’ve been going to Brio for several years and always have a wonderful experience! The staff is so friendly and attentive. It’s great for families they have plenty of choices for children and are very accommodating. Easter brunch. Somewhat noisy. Great service and good food! There were 6 of us dining on Sunday April 14. Two of us ordered cocktails, which took 20 minutes to be delivered. I'm not sure if she was newly hired, but she wasn't as attentive to our needs as was expected. We asked for more bread, it was brought out at the end of the meal. Some were finished. Being a major fan of the sister restaurant in Overland Park called Bravo (we've given a number of excellent reviews to Opentable for them) we made reservations at Brio for 6:45. We had tickets to a debut show as special quests of the director and the lead actor in the Movie. It was close by. We arrived at Brio before scheduled by a few minutes and was told it was going to be a couple minutes before they would have a table ready so we sat at the bar next to the host stand. Little did we know it was prom night and the place was all kids. After a number of attempts to get seated I finally demanded to talk to the manager 1/2 hour after our scheduled reservation time and told her of our dilemma. She was nice and immediately took us to a table and told the server about our rush. We had memorized the menu while waiting and ordered immediately. 35 minutes later with on 15 minutes before our show there was still no food. I found the manager and she checked on it. I told her we had just a couple minutes to eat and make it to the show. The food came almost an hour and 15 minutes after we arrived and it was terrible. The chicken was stiff as a piece of leather and lukewarm at best and the pasta was hardly warm on the outside and cool inside. I sent it back. A couple bites later my wife's was also cool and just as uneditable. She never complains. We asked for our check and another manager came to tell us he was taking care of it a which is good because we had 2 bites between both of us. He apologized and mentioned having problems. It was a horrible experience and I told him it was totally unacceptable and we won't be back. We tipped the server and left. We sat through the show on an empty stomach which ruined what we fully expected to be an enjoyable occasion but anything but that. Brio deserves better and so do their customers. Obviously understaffed I trust it was far from their best and really far from what their owners/stockholders would condone. We travel to KC from Tulsa every year a couple of times. 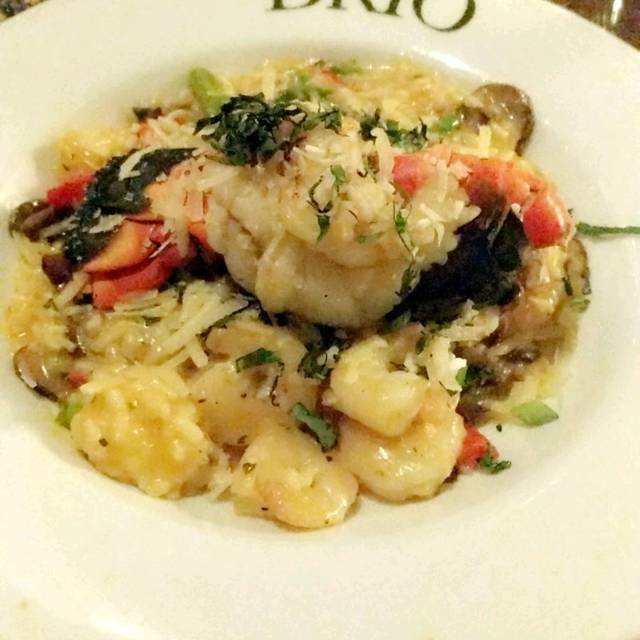 Each time, we try to have dinner at Brio and it never disappoints. Wish we had a Brio in our area; but that might make the trip to KC less rewarding. Went to celebrate our son-in-laws birthday. Had a reservation but had to wait. Sat for 15-20 minutes before a manager noticed we didn't have any water or anything and asked if we had been helped. Told her no. She took our drink order and brought us water. Told us our waiter would be over shortly. Had another 5-10 minute wait before our waiter finally took our order. My son-in-law ordered Alfredo with chicken and broccoli. Different waiter brought our meal and there was no chicken in his dish. Our waiter brought some cold grilled chicken for him to add after he was almost done. Very bad service. It appeared to be prom for some school but still would expect better service and food for 4 adults who ordered drinks, a bottle of wine and dinner. 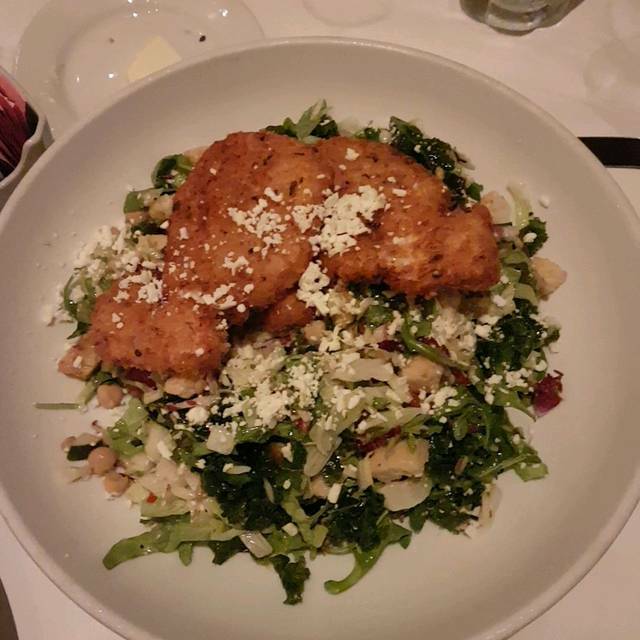 There are plenty of other options on the Plaza so don't need to visit BRIO again. It was a Prom night, staff and kitchen was overwhelmed. But food came out hot and was up to their usual standard. Wonderful experience. Great evening! Service and food were outstanding! We had a reservation for 6:00 P.M. We were done shopping at five so we asked if we could change our reservation. They were very helpful, got us a table, service was great, food was good. Very disappointing experience. Arrived at 11AM on Saturday morning for an anniversary celebration lunch. Despite being only one of a few tables with customers that early on a Saturday, our experience made it seem like the restaurant was slammed. Our food was delayed in arriving; when it did arrive, three of the orders were placed incorrectly around the table and two of the orders were incorrectly filled. Two customers, side-by-side at the table, ordered exactly the same brunch item -- when the orders arrived and were placed down on the table, the inconsistencies in plating were immediately noticeable in portion sizes and in temperature of food. We've always touted Brio's Sangria as among the best offered in Kansas City and ordered one. When several others at the table tried it, additional orders were placed. Imagine the surprise when our server came back 10 minutes later with just one glass of Sangria and an announcement that there was no more Sangria available -- at 11:30am on a Saturday morning during brunch period with no more than 5 other tables with customers. Seriously? 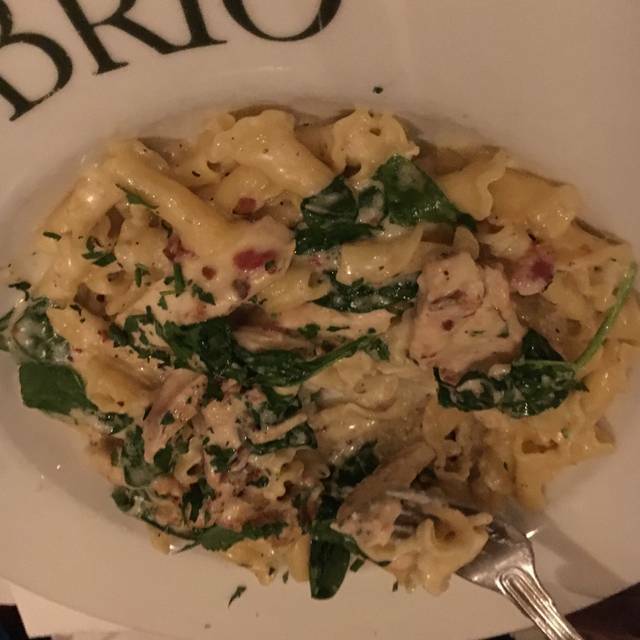 Just an overall disappointing visit for all of us -- probably lost some long-time customers, and certainly lost some of those eating at BRIO for their first time. Great food and great service. Lighting always a little too dim but otherwise a favorite destination. 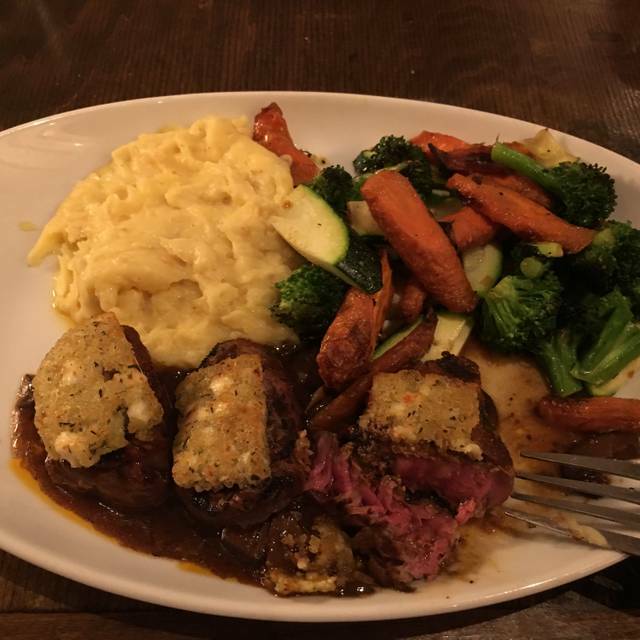 Ashley, our server made our experience amazing! Fun, great service and food! A really nice place for a really good vibes with your friends. Great date night option. Had a reservation and was seated early. Had a wonderful meal with my family. 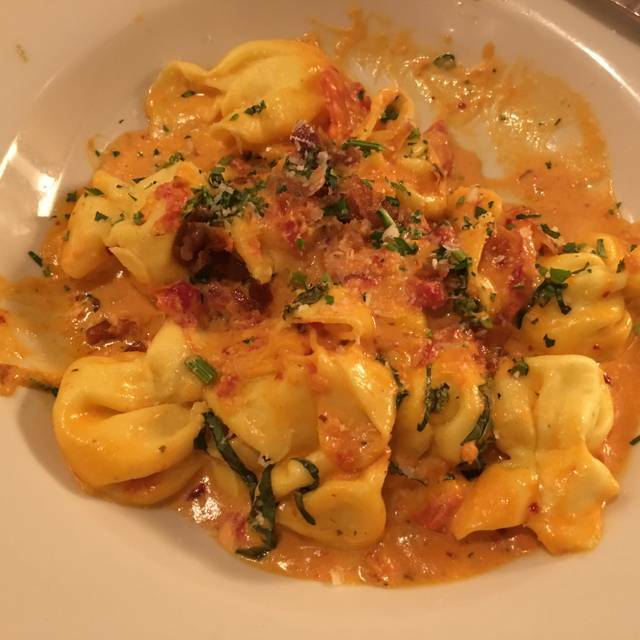 Lobster ravioli was amazing. Overall a great place and eat and enjoy a night out. Too noisy, too expensive, too dark, food quality was not there. It was okay. Not what I used to expect from the plaza. Awesome food and outstanding service. Bisteca was possibly the best steak ever. Nice wine added to the experience. Very impressed with all but the wine list and that only because the Duckhorn merlot wine that was listed on the menu and annotated with “2018 Wine of the Year (Napa, CA)” was NOT available in the vintage year that won the award. It’s perfectly fine for a wine not to be an award winner - we ordered and truly enjoyed the Duckhorn vintage that WAS available. But if you “advertise“ an awarded wine on the menu, you should follow through with the proper wine. Great date night with my husband! Delicious, made to our request, was much appreciated! The food was absolutely delicious and the service was amazing!!! Overall experience was good but our server seemed inexperienced and wasn't able to answer our simple menu questions. Granddaughter’s Baptism was the occasion. Excellent food and service. We come to Brio often. We met two friends for dinner on a Thursday evening. It was fun. My salmon was perfectly delicious. My husband’s food was not. He clearly said he wanted salad but it was not served and the server said the cooks went home! At 7:00! Our waiter was awesome but they forgot about our food. Once they realized and got it in the Manager let us know it would be 10 more minutes. It was longer but the worst part was my sisters dish came with chicken and she’s vegan so they had to remake it. For my daughter it was way too long (over 2 hours) so the free dessert wouldn’t have meant much. They did take care of our app and the messed up dish though. The food was really good otherwise but it wasn’t a great experience like we planned with family in town. Very good service! Food came out right away and our waitress was very hospitable. The food was great as always! We were there for two hours and did not get dinner. Eventually, I said I was no longer hungry and it was packed in to-go boxes and not palatable. The drinks, bread, everything was slow and behind. No attention filling water or anything. My daughters both ordered pesto chicken and one had way too much and the other one plain. Portions were not consistent and the one without pesto uses the others extra! Since we left, we we’re eating on the Concierge Room at the Intercontinental and it was much more enjoyable. At least there was service! 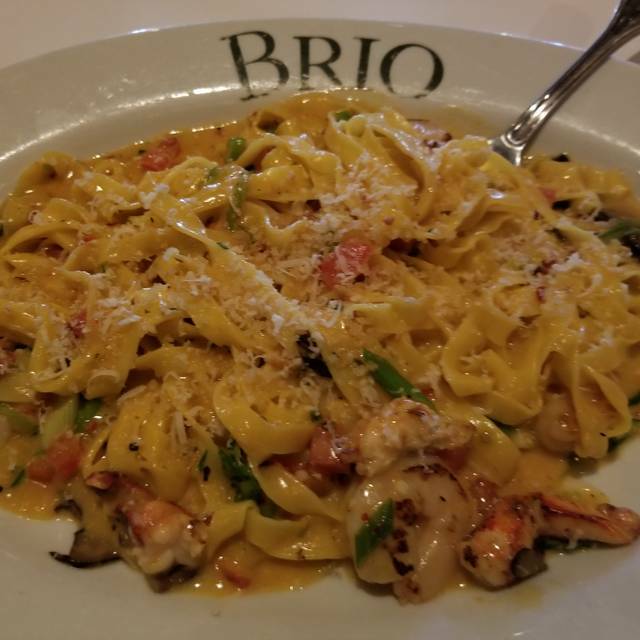 Normally the Brio is our go to place. They changed the menu and it's horrible now. Salad is very bland, steak was the worst I've ever had, asked for medium and it was small, all fat, and all red and chewy, the dropped the lobster off the menu, no sides, waitress tried to sit us at a table between the only other people in the place, we asked for a booth instead and she gave us a booth right next to them even though it was a large booth and there was only two of us. My wife didn't like the menu change either. Hopefully they fix their issues. Our entrees, spaghetti w/vodka sauce and spaghetti w/cream sauce and pancetta, were well prepared and very good. The wedge salad was very fresh and was dressed with outstandingly delicious blue cheese. The warm bread with butter served before the meal was scrumptious. However, being an Italian restaurant we expected good olive oil with grated parmesan and maybe some herbs to be served along side with the butter. We asked the waiter for some and he eventually brought just a shallow plate of olive oil. This was an area that did disappoint us. Our server was mediocre and didn't seem to have much interest in being sure we were having an enjoyable experience. He was also slow at responding to our requests as we had a 10 minute wait between our drink order and when they were served. When we requested wine, it was at least 10 minutes. 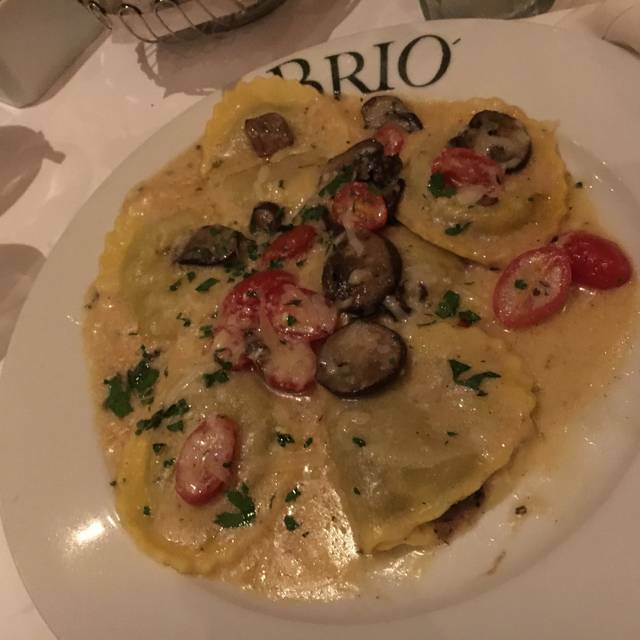 Brio's a good Italian place that can use a little help in their service and add a few extra special touches that would make a good experience an outstanding one. This place was amazing! I was a little skeptical at first because I waited till kind of last minute to book a reservation for Valentine’s Day but this place definitely didn’t disappoint! Great ambiance, great service and great food. I also can’t forget about the great drinks. I had the brio old fashion and it was fantastic! Already been recommending it to all our friends and we can’t wait to get back as soon as possible. Great food & great service even on a busy night! The restaurant was spacious & quiet enough to carry on good conversation. Took Waiter recommendations on food choice, and was very happy with it! Very good service and the food was excellent. The only comment I would like to share is that the tablecloth had stains on it, which was not appealing. Service was awful and it made for a really upsetting birthday dinner. Sadie Hawkins night - lots of kids. Cute, but loud that night. Excellent food though I did miss some old favorites. Tremendous service from Ray!